Fairfield County Wedding Photos have a certain air of charm and elegance. The Fairfield County Wedding Photos taken at this celebration were no exception. In this picture, the grooms look on attentively as friends and family stand up to toast to the newlyweds. Each person who takes the microphone shares a story of time spent with the two men, both as individuals and as a couple. The guests who speak are delighted to be present for this special day, and to experience yet another magical memory with these two incredible people. The expression on the faces of the grooms is full of joy and amusement. They laugh as their loved ones relay funny memories and smile fondly as a few talk about the day the newlyweds met. The dinner reception was held in a tent on a private estate in Fairfield County. It was a gorgeous day for a summer wedding, with the sun shining boldly overhead as the celebrations continued throughout the day. At this point in the wedding day, the sun has begun to set and gives the area beneath the tent an enchanting glow. The sunset’s colors dance over the roof of the tent, washing the space beneath it in its warm light. Inside the tent tables are set in preparation for dinner, as the toasting of the grooms continues on. Also on each table is a unique centerpiece. The centerpieces vary, each a construction of modern art. 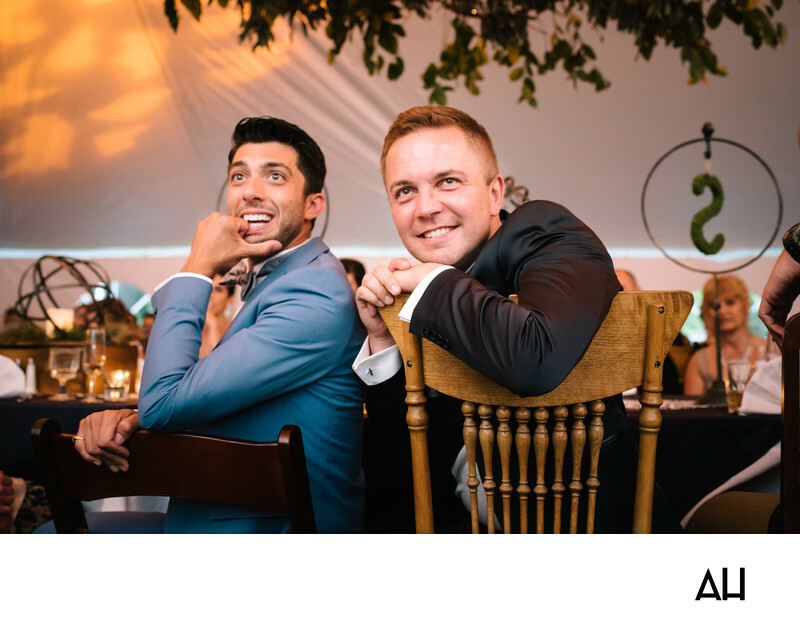 The most wonderful details in the room, however, are the expressions of joy on the faces of the grooms.